Besta Asa vividly remembers a warm sunny day, sitting outside her home in South Sudan, breastfeeding her babies. Her children were playing when she first heard the gunshots, but she wasn’t immediately concerned. She became fearful when her husband rushed home from their farm and she learned her family had to flee. Wasting very little time, they escaped with a crowd of people—running to save their lives. The 27-year-old mother of six remembers staying in the bush for four days. The children were irritable and hungry because they had no food or water. Her husband was only able to return to their home long enough to get food for the family. Starting in 2013, the civil conflict in South Sudan forced Besta’s family and thousands like hers to flee their homes. According to the United Nations, 1.8 million people are displaced within South Sudan, while 1.5 million have fled to neighbouring countries. Besta, her husband and family have now settled in a small, temporary shelter near to where her mother lives. She mourns the fact that her family must be supported by other people, when she would much rather be tending her farm and planting food for her family. 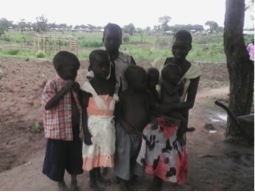 In the meantime, Besta acknowledges that the food assistance they have received from PWS&D, through a Canadian Foodgrains Bank supported project, has given them hope. Food distributions of sorghum, oil and salt has allowed her to worry a little less about how she would care for her family. Besta received support through a project that distributed food packages to 2,450 households (approximately 16,000 people). With input from local partners and community leaders, the project targeted households with children and pregnant and lactating women, those living with disabilities, elderly people, as well as those headed by women and children. Despite the hardships her family continues to experience, Besta has hope for the future—for a time when the family of eight can return home to their farm, where they can grow their own food again and support themselves. Famine is now a significant issue for many who have been displaced due to the ongoing conflict. PWS&D continues to respond in South Sudan. Please give today! 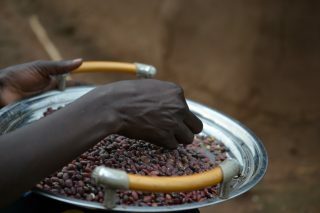 For more information on PWS&D’s South Sudan response, click here. *This project receives support from Canadian Foodgrains Bank. PWS&D is a member of Canadian Foodgrains Bank, a partnership of 15 churches and church agencies working together to end global hunger. This project is undertaken with matching support from the Government of Canada.